The depth and breadth of this amazing encyclopedia is a staggering feat and a glistening diamond in the crown of every Jewish library. 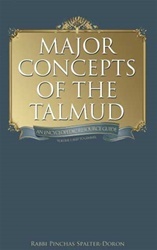 With scholarly ease, the author, a seasoned Judaic-studies teacher and writer, explains the major concepts explored in the Talmud with succinct and clear terminology and examples. This book is the answer to every student who has ever said, "I wish there was an English resource to explain Talmudic concepts!" It more than fulfills the reader's expectation--and leaves us waiting for the volumes yet to come!